It's hard to imagine condensing this kind of sweeping change into eight steps within a blog post. Thanks to an article published in the July-August 2018 edition of the Harvard Business Review, most of the heavy lifting has already been done. Aside from the eight, clearly defined steps to Create a Purpose-Driven Organization, this article makes two important points. Build off our current successes, wherever we may find them, and emulate the conditions for that success elsewhere. Purpose cannot be imposed on people or an organization. A disingenuous definition or interpretation of an organization’s purpose will only serve as hollow platitudes, that people will struggle to get behind. Tying back to the discovery of purpose, this idea resonates throughout. Without authenticity, any message, mission, vision, values, or cultural underpinnings will lack the substance to be of any actionable value. Integrity and authenticity are essential components for accomplishing any of the other steps. Consistency works not only to spread the authentic message but to also reinforce the authenticity of that message. Helping employees understand the relationship between the organization’s authentic, higher purpose and their individual learning process strengthens both areas. Challenging individuals to learn and develop, independent from explicit oversight or instruction, displays faith in their ability and potential. This allows their job to become an incubator for learning and development, and along the way, the employees gain confidence and become more committed to the organization and the higher purpose that drives it. 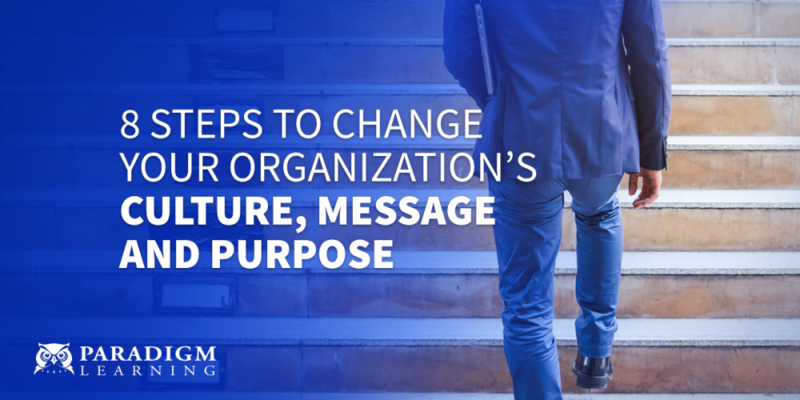 By talking openly about their own sense of purpose and meaning, leaders can connect their tangible stories and experiences with the organization’s abstract purpose. After these leaders at the top and in the middle have internalized the organization’s purpose, they can help frontline employees connect it to their day-to-day tasks. A top-down approach will not genuinely connect people to the purpose. Employees need to help drive this process, allowing the purpose to spread throughout the culture, shaping behavior even when leaders aren’t around to monitor their actions. Every organization has a pool of change agents that usually goes untapped. Spread randomly throughout the organization are mature, purpose-driven people with an optimistic orientation, that naturally inspire others. They’re open and willing to take initiative. Once enlisted, they can assist with every step of the cultural change. These people are easy to identify, and others trust them. See how Paradigm Learning uses Experiential Learning in classrooms and large events to unleash positive energizers.